Replace your outdated baseboard air registers with this modern 5.5" tall Shoemaker vent. Our galvanized steel vent covers with adjustable damper are durably made to control your homes airflow. These Shoemaker baseboard air registers are perfect for modern homes which have taller baseboard trim on their wall. This steel vent cover will project out in a triangular fashion from the wall about 2 3/4". Our baseboard air registers are installed by screw mounting the unit into the wall by removing the faceplate. Screws are not included with the purchase. Cleaning your steel vent cover will also be a breeze since the faceplate simply detaches from the front. The baseboard air registers have a built in tension wing to help stabilize and prevent noise while the air is pushing through the vent. 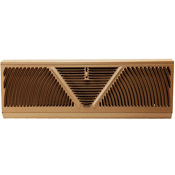 Choose your brown steel vent cover in the 3 sizes listed to revamp your home. The faceplate is formed in a tri-directional sunburst pattern to offer the most airflow. This steel vent cover is perfect for remodels, but we also offer smaller triangular baseboard air registers for older home renovations. Order your baseboard air registers in brown to match any home decor!